If two devices have to talk to each other, they must adopt the same protocol. In the past, I’ve already shown different types of communication, for example between Arduino and a C# program, Arduino and a website or Arduino and an NTP server. All those communications are point-to-point ones, that is between two actors. Today I’m instead going to introduce you a quite special protocol: MQTT (MQ Telemetry Transport). The main feature of MQTT is to be a publish/subscribe protocol. synchronization decoupling: operations are not halted during publish or receiving. From what above said, it’s easy to understand why the MQTT protocol and the pub/sub paradigm in general is very used in the Internet of Things: the simplest devices, often powered by batteries, can activate every tot seconds, send the data to the browser and return to power saving mode. It’s the broker, that is always active, to send the data to the end users (actuators, dashboards…) when it’s needed. Later I’ll explain how topics are structured and how it’s possible to subscribe more topics using wildcards. After the introduction part, let’s see how to use the MQTT protocol. You now know that the most important element is the broker: one of the most used software as MQTT broker is mosquitto. Mosquitto is available for almost all the operating systems (Windows, Linux, MacOS); today I’ll show you how to install and use it under Windows. First, download the latest version from the official site and unzip the archive in a new folder. Now we can run mosquitto. 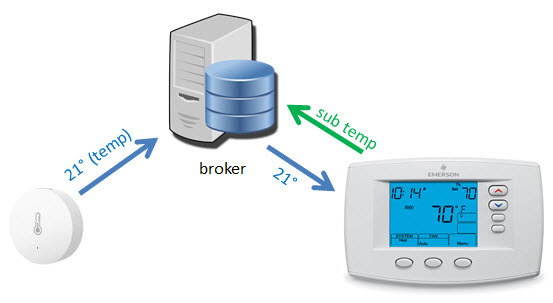 Open 3 command prompts: one to run the broker, one to simulate the temperature sensor (publish) and one to simulate the thermostat (subscribe). In this first article, I introduced the pub/sub paradigm and the MQTT protocol. I’ve also shown how to use mosquitto as a broker to send/receive messages. In the next articles, I’ll show you some real examples, with Arduino (and not only…).